Berwick Bandits have made another change to their team with the experienced David Howe being drafted in as a replacement for the out-of-form Liam Carr. Howe will make his debut for the Bandits in their Championship meeting away to Workington on Saturday, while Carr will now concentrate his efforts in the National League with Birmingham. 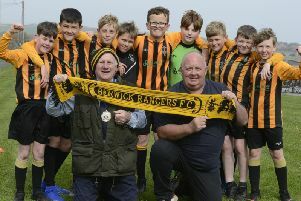 Berwick, in their 50th year of racing, have failed to win a league meeting so far this season, and after a run of nine successive defeats have been desperate to try and turn things around. Following the recent departure of Claus Vissing, Dimitri Berge and Ryan Blacklock, with Nick Morris, Jye Etheridge and Lee Payne being drafted in to take their place, Berwick still had room to manoeuvre following the release of the new averages which came into effect at the beginning of May. It wasn’t a decision the new management team took lightly, and co-promoter Scott Courtney said: “There’s always going to be mixed feelings when team changes are made and this one has been the toughest for me personally. “On one hand we are super excited to hand David this opportunity to again show why he has been regarded as one of the great British talents in the last 20 years! “Grand Prix experience, Team GB experience, an impressive domestic league record and world Longtrack success is what David Howe will bring to the club and we are sure that he will recapture his speedway form in no time. “The other side of the coin has been a tough one. Liam Carr is a Bandit through and through and in many ways we feel like we’re pulling a boxer out of the ring to not sustain any further damage. “Liam’s confidence has been battered with his stint in the main body of the side and it’s tough to see. “Liam has now gained a more realistic average that has enabled us to help him get fixed up at Birmingham in the National League. The clean slate starts now and we will assist where we can in helping him get back to the Liam Carr we all know and think a hell of a lot of. The new look Bandits side, pending BSPA approval, is: Morris 8.97, Doolan 7.26, Howe 6.72, Bridger 6.26, Gappmaier 4, Etheridge 4, Payne 2.61. Berwick picked up their first league point of the season with a losing bonus at Redcar on Thursday. The Bandits produced their best away performance of the season so far, going down by only six points. Lewis Bridger was riding in the British Championships semi-finals – a meeting from which he qualified after a run-off – and Newcastle’s Stevie Worrall was used as a guest. He won two of his first three races and also took four points from a second place as a tactical ride in heat six after Berwick found themselves 20-10 down down after the first five. Kevin Doolan emerged as Berwick’s best rider on the night, winning three of his races, whilst new signing Nick Morris won two. Another newcomer, Jye Etheridge, also won one of his rides, and it was two heat advantages in heats 13 and 14, with Morris and Doolan taking the chequered flag (the latter a 1-5 with Dany Gappmaier) which brought the score back to 45-41, taking the meeting into a last heat decider. However, Charles Wright had his fourth win of the night to give the Bears victory, but the six point defeat meant Bandits picked up their first point of the campaign. Team manager Gary Havelock was much happier afterwards when he said: “That’s more like it. Redcar: Wright 13, Perks 10+4, Garity 8, Barker 8, Andersen 6+1, Garcia 3, Hall 1. Berwick: Morris 12, Worrall 11, Doolan 10, Gappmaier 5+2, Etheridge 3, Carr 2, Payne 0.
q Liam Carr has signed for National League Birmingham and will double up with the Brummies in the third tier of British speedway. q Lewis Bridger scored nine points in the British Championships semi-finals at Sheffield on Thursday, and following a run-off qualified for the British Final.